Looking for gripping novels to fill up your ereader with? Want to while away the time at the airport? Include A Passionate Spirit on your holiday reading list. If you like thrillers with more than a touch of the paranormal this is for you! Janice an Amazon reviewer, took A Passionate Spirit on holiday with her and says I loved it, I was hooked from the very beginning, the characters got inside my head, and I couldn’t put the book down. I was really very surprised at how spooked I felt considering I was on a sunny beach in Tenerife very far removed from the Cotswolds. Thank you for a great read. And why not also download Mystical Circles? If you do, I suggest you read Mystical Circles first because it may add more depth to the background of some of the characters. But Sue does add that the two books could be read in any order and would still be enjoyable. Enjoy your holidays… and happy reading! I had a great time at the Leamington Peace Festival over the weekend, and enjoyed chatting to many interesting people at my local author stall. Not only did I sell some books to keen readers, and meet someone who was uncannily like one of my characters in Mystical Circles, who asked me for advice on how to start his own book, but also had a conversation about the paranormal involving a dog and the council and several fast-disappearing residents from a Birmingham house, which gave me ideas for future use in a novel! 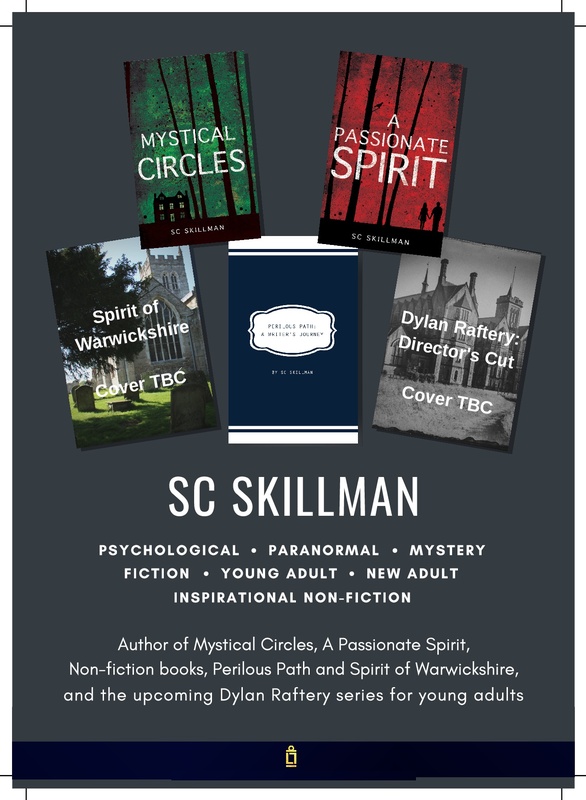 I’d love to see you on Friday 24 June 11am to 2pm in Costa Coffee, Royal Priors, Leamington Spa, where again I’ll be selling signed copies of both novels. Do drop in if you’re in Leamington that day! 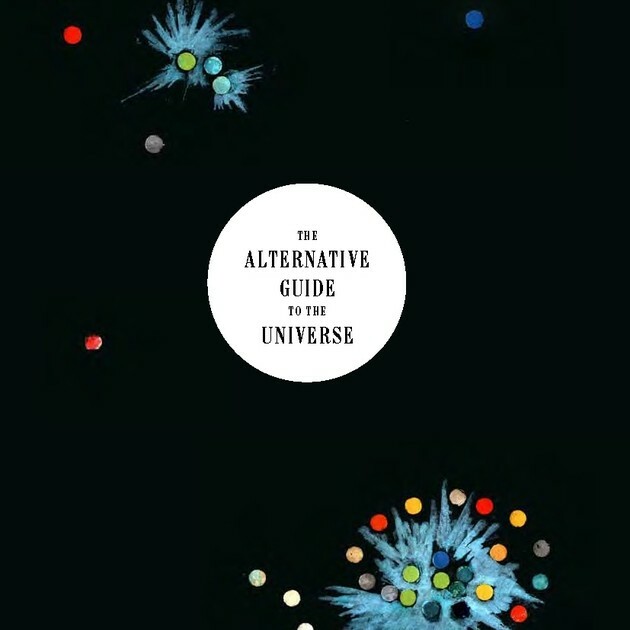 I bought this book recently in a National Trust gift shop, and found it captivating. Rosalind Kerven explores the raw material from which many of our great fantasy novelists have derived their archetypes. She includes “mystical tales of faery royalty, mischievous goblins, helpful house-elves, changelings and enchantments across the British isles”, with spotlight features on “faery folklore, faery morals, the various faery tribes, and spells and dealings between faeries and mortals”. As a paranormal thriller writer I loved this wonderful survey of centuries of folklore and faery mythology in England, Ireland, Scotland and Wales. Rosalind Kerven covers all the major themes in traditional tales of the faery realm, including what she describes as “typical Faery perversity”, spells that are both mischievous and malevolent, and the toxic nature of any deals struck by a faery with a mortal. Reading these tales reminds us that any mortal who ultimately comes out well from dealing with a faery, is extremely lucky! Shakespeare had it exactly right with his fairies in “A Midsummer Night’s Dream”, showing them having fun with and mocking the folly of the human beings, then putting things to rights once they have tired of their sport, wryfully signing off with the words, “If we shadows have offended…” In widespread stories down through the centuries, faeries are shown behaving towards mortals rather like a supernatural gang of brigands running a protection racket. These tales made me reflect upon how much they say of the life experience of their creators; an explanation for the changing fortunes we all encounter in this world. There is so much here that we can identify with on the level of our own unconscious: “The transformation of a familiar path into an endlessly looping labyrinth” – for which a well-known antidote is to “remove one’s coat, turn it inside out and put it on again”; the experience of being “pixy-led”; the idea of obtaining “faery sight” which reveals a parallel world. I can see from this book how deeply influenced JK Rowling was by British folklore, in the Harry Potter novels: Dobby is set free when his master gives him an item of clothing; Harry is deposited as a baby on the Dursleys’ doorstep, by magical agency; and the idea of veritaserum, to name just three examples among countless others. Highly recommended for adults interested in a survey of archetypal themes in folklore and mythology, though not suitable as a storybook for young children; they are best introduced to fairy tales and folklore through the many other books aimed specifically at their age-groups. I saw the last Hobbit film two days ago: The Battle of the Five Armies. And as I watched it I had a strong feeling of Peter Jackson making the most of his final cinematic visit to Middle-earth. Everything was exploited to its fullest extent, the brutality of battle, the sublimity and peril of the landscape, the tragedy of a hero lost in his lust for gold, the goodness and simplicity and down-to-earth appeal of Bilbo, the ugliness and brutishness of the orcs, the grandeur and regality of the elves, the mystical presence of Galadriel. As a lover of JRR Tolkien and the fantasy world he created, I first read The Lord of the Rings, The Hobbit, and the Silmarillion while I was at university. 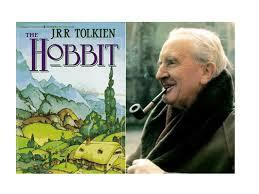 When I read the Hobbit I remember loving it even more, if that were possible, than The Lord of the Rings. I felt it contained all that the longer book contained, but within a smaller, more compact package. I don’t think it’s possible to think this about Peter Jackson’s Hobbit films! Even so, I felt in this final trip to Middle-earth Peter Jackson excelled himself in terms of long scenes of extended hazard, in archetypal themes of love and compassion versus cruelty, brutality, and the lust for gold. How glad I was when the Lady Galadriel appeared in the dark, craggy, landscape in her shining white robes. And when Bilbo finally said he was off home, I thought, Cue for the eagles to fly in and give him a ride back to The Shire. But no. He had to walk. I loved the way the landscape grew greener and more warm and welcoming as he approached closer to Hobbiton. Considering the very unassuming and childlike way in which the original novel The Hobbit begins, who could ever have guessed it would lead on to such heights of creative imagination. And in the world he created, JRR Tolkien gave us many poignant and ominous reflections upon our own world, on the nature of life, and the human condition, as well as the spiritual purpose and destiny of the human race. Throughout this series, mountains have been an important image for me. And now we arrive at the end of my mini-series, we find ourselves on a mountain again. And this mountain is on the opposite side of the world to the mountain where I had my first childhood experience – in Australia. I’ve told this story before on this blog. And so it is with important experiences – the story must be told again and again. 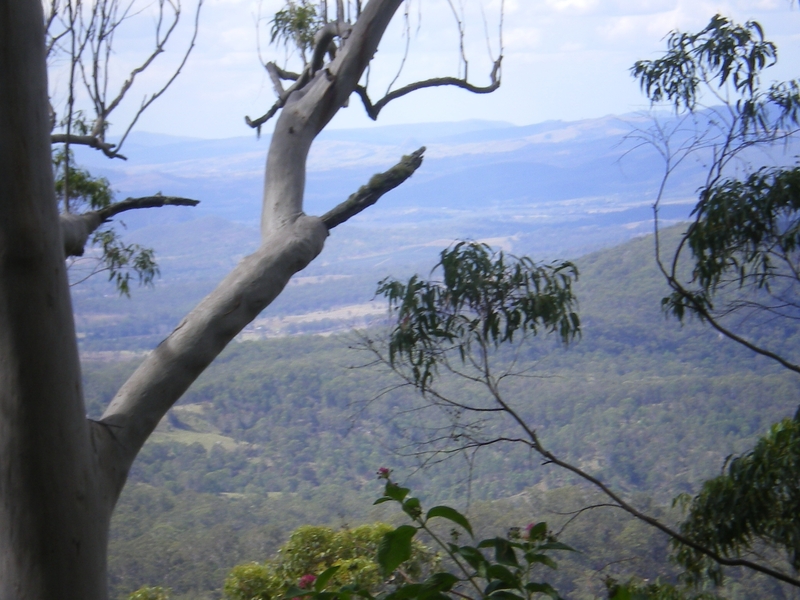 On the border of Queensland and New South Wales, behind the Gold Coast, you may find the Macpherson mountain range, part of the Great Dividing Range. The road leads from Southport via Nerang up through Mount Tamborine to the town of Canungra where you may continue your journey to one of two mountain resorts: Binna Burra or O’Reilly’s. I was negotiating the mountain passes on the way to O’Reilly’s. In the passenger seat was my 18 year old niece Caroline, who was visiting Australia for a month (where I lived at the time). Caroline had mentioned that she and her friend Jo (her fellow traveller to Australia) had gone to Sydney to stay in a house of students who they knew nothing of. And discovered that they were all committed Christians – just like Caroline and Jo. Caroline found that wonderful. I said, “Well, like attracts like” – for I at the time believed that this apparent coincidence was the operation of the Universal system / the principle of “reality follows thought.” But Caroline was having none of this. “No, it was God,” she said. I didn’t want to argue with her. Especially as I was driving up a perilous mountain road at the time. My own beliefs were a mixture of NeoPaganism, Pantheism and Eastern Mysticism. I pursued gurus, tried Buddhism, practised eastern forms of meditation and various esoteric philosophies, teachings and techniques. I prepared to go into “indulgent tolerance” mode whilst we climbed higher up the mountain range. It was because of that very black-and-white “certainty” that I had long mistrusted evangelical Christianity. But Caroline then launched into a full exposition of the gospel and of the fact that Jesus Christ had come to bridge that divide between God and humankind; and when we reached our cabin in the resort, she drew for me a picture of a cross bridging that chasm. All the time I was in tolerance mode. I didn’t need evangelising. I considered myself knowledgable about the bible, & had been good at R.K. at school. So I just let Caroline do her thing, until she at last got distracted by a snake lying in the path. For the next year I continued in my usual way, following my own spiritual interests, occasionally thinking of this episode. OK I hadn’t liked being evangelised. But I was impressed by her conviction, by her belief that her religion wasn’t a private matter, it was to be shared; and by her courage. I thought, “I wouldn’t do that.” It’s a personality thing too, but I actually believed everyone has a right to their own beliefs & it was no business of mine to try and convert someone else to my beliefs. But Caroline believed she not only had a right but a responsibility to tell me what she believes. I was impressed by that. But I didn’t do anything about it until 1991 a few months after I’d returned to live in England, with my parents in their Kent village near Tonbridge – and it changed my life. Have you ever changed your life as a result of a conversation with one person? Or was it a long process, involving several people, covering a number of years? Please share your own stories with me! Mountain at end of road in Wales. Mount Neel Kanth in India. On the mountain top at Binna Burra, Queensland. Do you identify with this journey? Share your thoughts and feelings with me about this journey of the spirit. I’d love to have your comments!